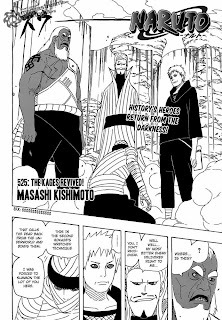 After what happened with Zabuza anda Haku, Kabuto become more serious with his evil plans. By using second Tsuchikage, he summoned other previous kages except the former hokage. Its seem they are not get along well in the previous life, but the problem is now they are under Kabuto's control, so surely they'll be dangerous enemies for squad joint army. And the worse is some of them also has ability beyond that a bloodline limit, for example is second tsuchikage with a Bloodline Expansion. More powerfull enemies has been showed up, forced the squad joint army to change their plan. Darui's divison would be faced with several powerfull people like asuma sarutobi (Shikamaru's sensei), Dan (Shizune's uncle and Tsunade's lover), The former leader of clan byakugan, Kin-Gin Brothers and every single one of them is infamously strong. What will happen in the next battle between them?